Having been exceptionally low for much of this year the overall extent has not declined as strongly as it might. So extent is no longer the lowest since 1979. Comparing the 7 day extent averages for the end of April and the end of June it can be seen that whilst extent was strongly at record low levels in April, by now it has lost the lead. 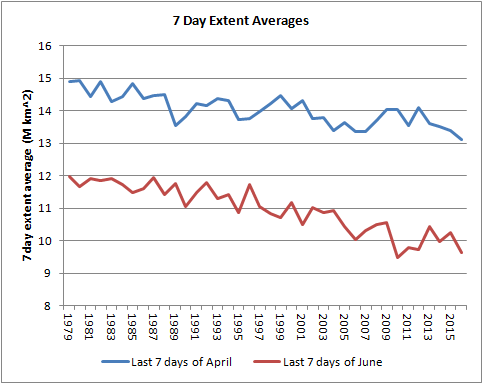 Taking the average extent for the last 7 days of June 2016 is the second lowest, lower then 2012 which ended up the lowest September extent by some margin. However the lowest extent in 2010 was not a record low September extent due to survival of ice in the East Siberian Sea, something suggested by current extent data and by Slater's persistence model, both of which will be addressed shortly. 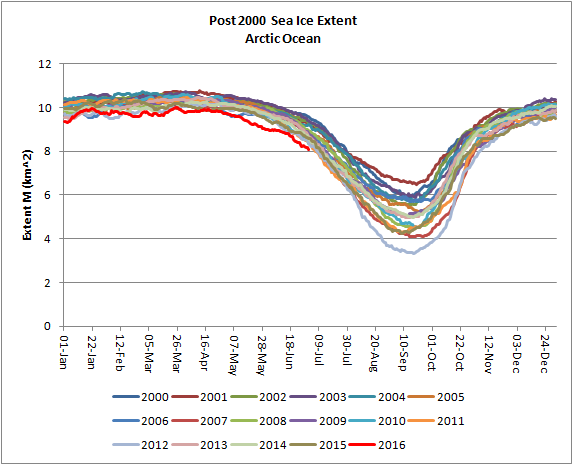 Extent in the Arctic Ocean however remains strongly lower than other recent years, which makes it the lowest since 1979. This is a result of the ice edge in the Atlantic sector (Barents and Greenland Seas mainly). 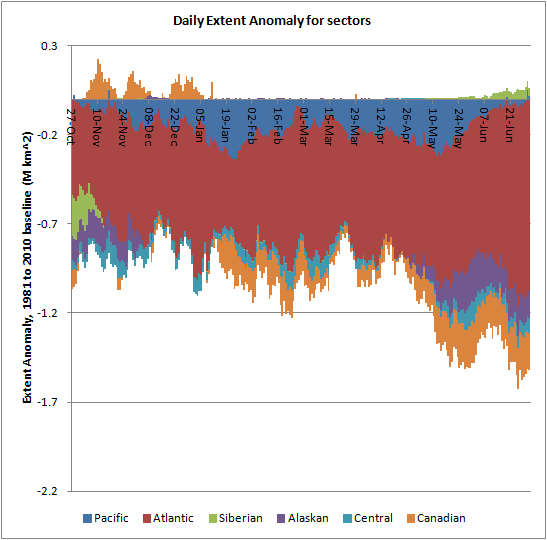 The following plot shows the anomaly from the 1981 to 2010 average extent and the Atlantic sector accounts for most of the below average extent this year. Compactness is the ratio of Area and Extent, in the Arctic Ocean this is not exceptionally low. In the Peripheral Seas extent loss has stalled. 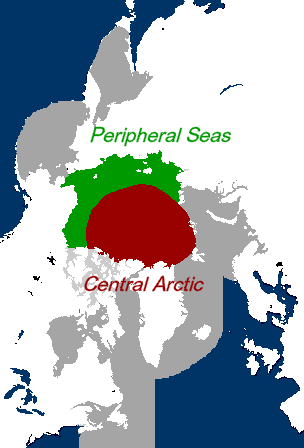 The ice edge must move through the Peripheral region for strong losses in the Central Arctic. 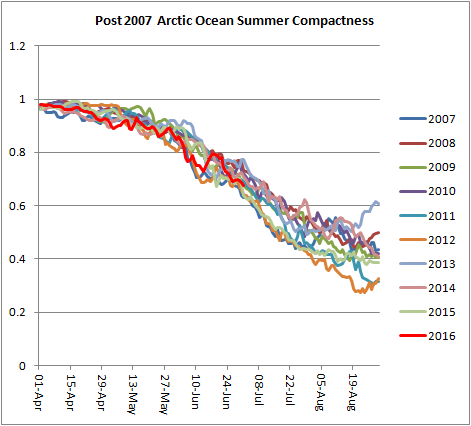 Compactness in the Peripheral Seas is within the set of recent years, not unusually low as was the case in 2007 and 2012 (record years). 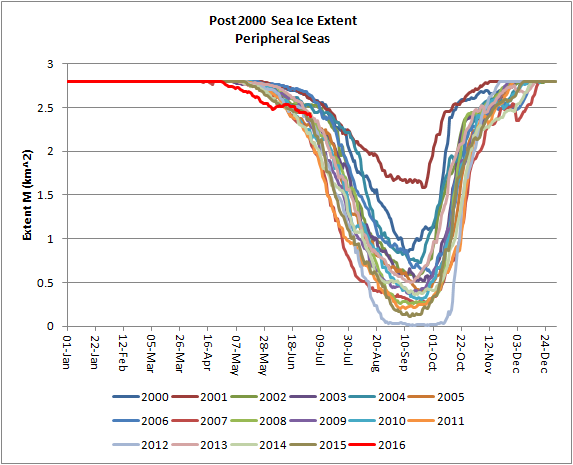 The title of the following graph is wrong, it is for the Peripheral Seas, not the Arctic Ocean. The Peripheral Seas can be broken down into contributions from the Alaskan (Beaufort/Chukchi Seas) and Siberian (East Siberian/Laptev Seas) sectors. 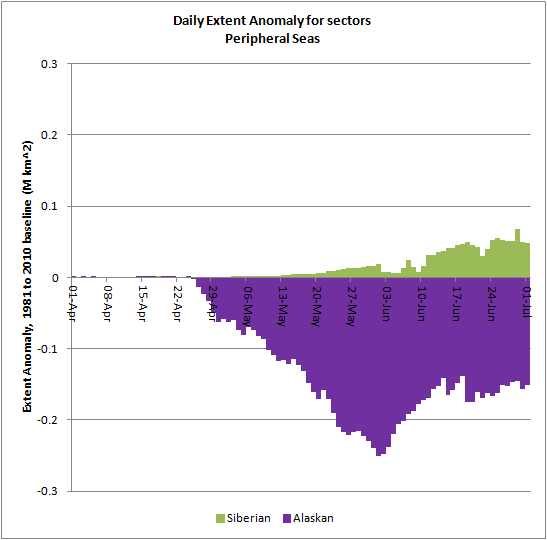 Losses in the Alaskan Seas were above average until June, when the losses switched to being below average. This reflects a massive shift in the atmospheric regime, from a dominant high pressure state in May to a dominant low pressure state in June. The Siberian sector is not showing above average losses. This might be significant, in 2010 the end of the summer was marked by a persistent mass of ice in the East Siberian Sea, Bremen, Dr Slater's persistence predictions may be suggesting something similar. And this might be connected to wind driven export from the Beaufort and Chukchi Seas over winter. 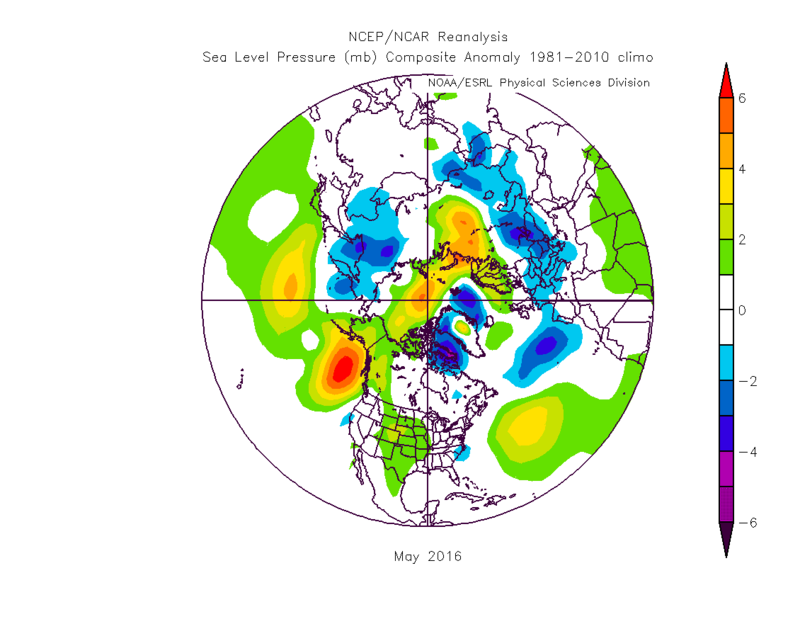 The striking difference between the May and June pressure regimes is shown in the following two graphics from NCEP/NCAR. A result of this may be seen when the PIOMAS data is in, I expect it to. However for now certainly the daily updated DMI volume shows it. Volume loss over June does not seem to have been very strong in the context of recent years resulting in volume starting June tracking 2012 volume, and ending up with a significantly higher volume. So what of the rest of the summer, if we rule out a record low that still leaves interesting play for the position of September 2016 in the rankings. The weather forecast for the coming weeks remains mixed, what of predictions? 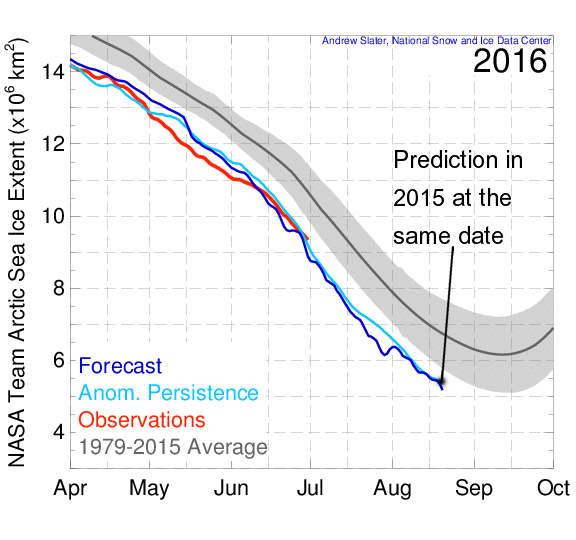 Dr Andrew Slater has been publishing a sea ice concentration persistence based predictions this year and last. The current situation suggests an extent in mid August extent similar to last year. Along with others Dr Slater has entered the Sea Ice Prediction network which has recently reported the predictions made in early June. 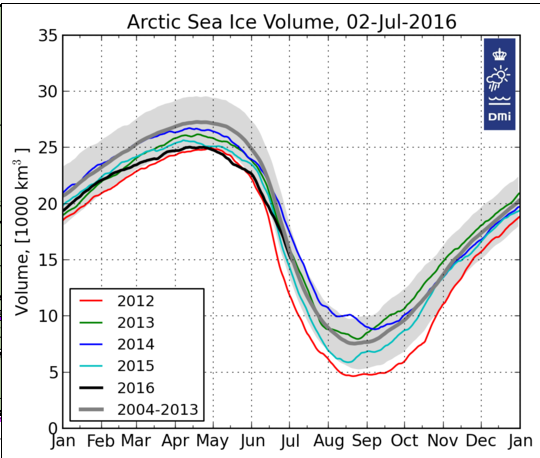 Chris, current sea ice volume is close to 2000 km3 lower than 2015, so your DMI volume graph is exceptionally wrong. Thanks for the post, Chris. I have a few comments and one question. where is 2012 in that plot around this (beginning of July) time ? is quite convincing. Low pressure means low temperature, which very well explains the late melting onset over the Central Arctic this year, and also explains some of the ice diversion (driving ice from the center into the peripheral seas). 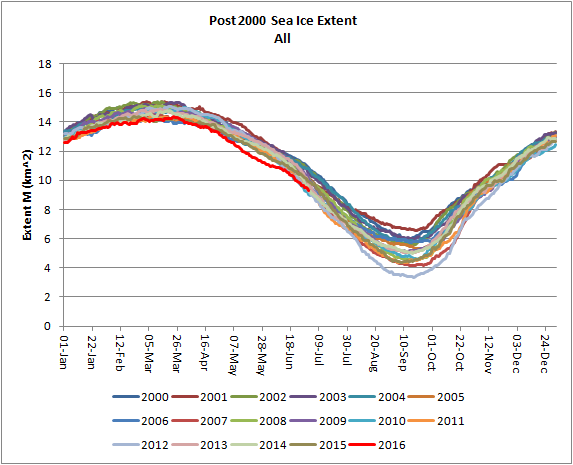 All this explains the reduction in decline of ice extent and area which brought 2016 back to other years. - Second, at this time, 2016 is still leading the pack (on IJIS) or in the top-3 (on NSIDC and CT). And it did all that despite that low in June, and despite the fact of lower-than-normal temps across the Arctic. Now that things are warming up a bit...brace yourself. - Third : Please do not pay much attention to DMI's ice thickness model. It does not have any track record and seems to go all over the place (freezing faster than PIOMAS, melting slower than PIOMAS, but never the same as PIOMAS). With its long track record, PIOMAS should be more reliable (although not infallible), and that is the model that you use most. So just stick to that. If that ESS section is cut-off, then we may see another 2012 coming up. 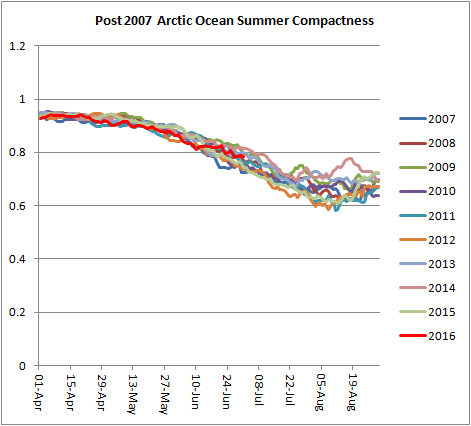 Peripheral Seas extent at the start of July was not substantially lower in 2012, but compactness was. I know you still expect 2012 might be beaten, we've not long to see what happens. Sorry for the brief reply. I'm currently in the process of moving my savings out of UK/EU based assets so haven't got the time for sea ice. All my research time is taken up with financial matters. I said in the post that I was using the DMI data as indicative. In that sense PIOMAS and DMI agree. Both started June with 2016 the lowest on record, both finished with that not being the case. For PIOMAS 2016 is now indistinguishable from 2010 and above 2012 and 2011. 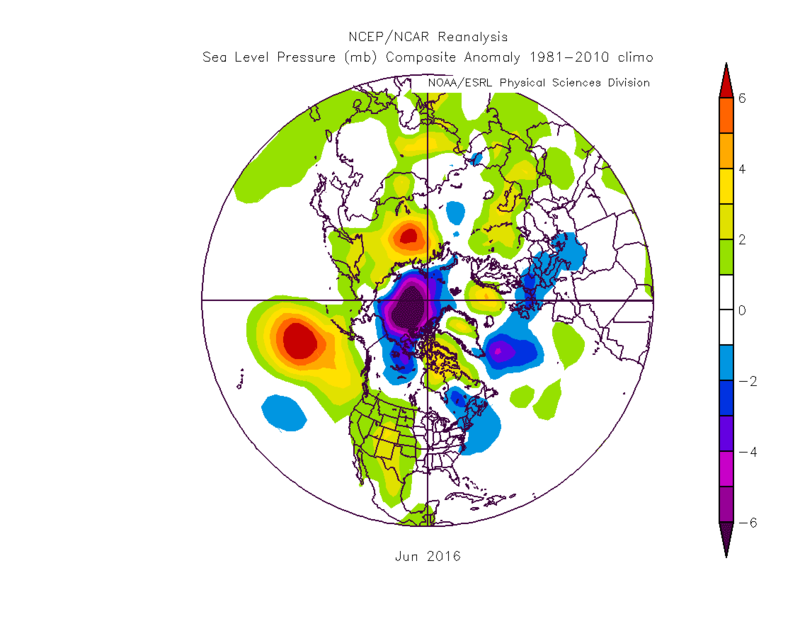 "Peripheral Seas extent at the start of July was not substantially lower in 2012"
Thanks. So is it true that "extent" in the peripheral Seas at this time is not really a good indicator for final September extent ? It is very hard to see which years have lower ice concentration in the peripheral seas than 2016. Looks like 2012, 2015 and 2011, but please correct me if I'm wrong. Also, it looks like that concentration in the peripheral seas bounces up and down quite quickly. Is that still a good indicator for 2016's ice extent ? "I know you still expect 2012 might be beaten, we've not long to see what happens." I've gone on the record to put the probability of beating 2012 at just 8%. So you are right that I believe if "might" be beaten, but I'm not putting my money on it. "All my research time is taken up with financial matters." Regarding Brexit. I think the UK made a big mistake. But that is an opinion. "I said in the post that I was using the DMI data as indicative. In that sense PIOMAS and DMI agree. Both started June with 2016 the lowest on record, both finished with that not being the case." That is kind of avoiding the issue, Chris. 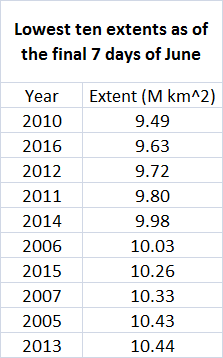 DMI shows about 4,000 km^3 difference between 2012 and 2016 at this time, and DMI puts 2012 at par with 2013. PIOMAS on the other hand shows only 1,000 km^2 difference with 2012, and puts 2016 far below 2013. Little things like that cast doubt on DMI's volume/thickness estimates, don't you think ? DMI - not avoiding the issue at all. What I said was correct and my broad use of DMI was sound. Compactness - no, see my previous post.